Thank you for another fantastic sale weekend! The store is almost all put back together complete with a nice selection of sale fabric. I'm working on some Easter/spring related crafts considering we're half way through April and Spring might finally be showing up! 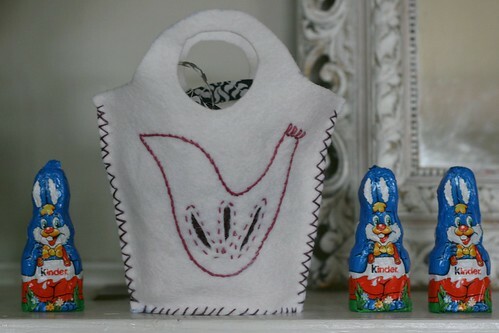 I've talked about Scandinavian Needlecraft by Clare Youngs before, and couldn't help but pull it out to make some baskets for this weekend's chocolate bunny hunt. This is a low tech project, requiring only felt, embroidery thread, and basic sewing tools. The pattern calls for enlarging the template by 200 or more percent, but I opted to make a mini version using the pattern at scale. After I cut out the basket, I used a water soluble pen to sketch my design and embroidery thread to stitch it all together. Bolt carries craft felt, small sheets of 100% wool felt, and a wool rayon blend. I used the latter. It has a lovely hand and it is thick and durable. Lots of folks come in to the store looking for larger quantities of 100% wool and industrial wool felt. Both of these items tend to be incredibly cost prohibitive for a store our size to carry. While the wool blend might not be what you're looking for, it is lovely to work with and I encourage folks to give it a try. This is a fast project, and it's a good thing-- once the sun comes out here in Portland, it gets harder to stay indoors! Thank goodness for chilly evenings and quick crafting. Weekend Projectsgina April 18, 2011 Accessories, Home Dec.